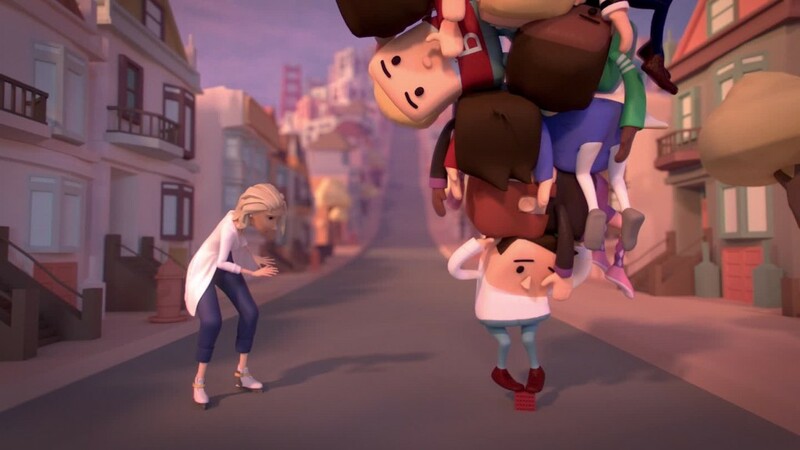 Imagine doing laundry in a flash -- just by hanging your clothes outside. Or what if you could get rid of that coffee stain just by standing under a bright light? Researchers in Australia say they have found a way to alter fabric so that stains disappear after a few minutes of sun exposure. They dip the fabric into a special solution that coats it with microscopic copper and silver particles. 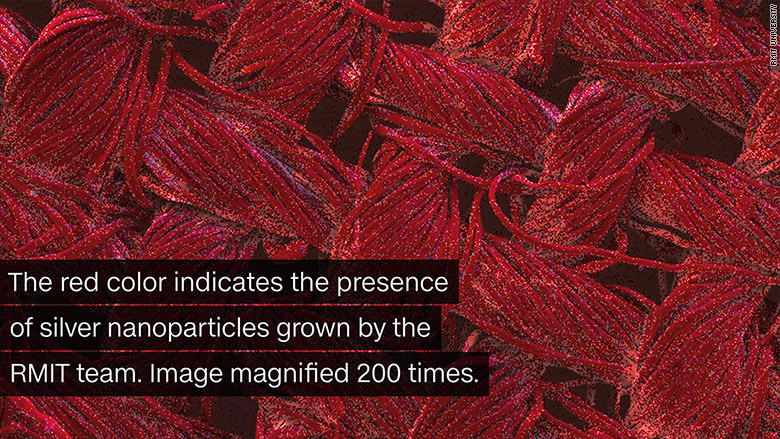 When hit with light, these particles jump to life and act a bit like bleach. "They get excited, then they degrade organic matter," one of the researchers, Rajesh Ramanathan, told CNNMoney on Wednesday. The tiny materials don't eat into the cotton "because cotton is cellulose -- is very tough." Ramanathan is part of a team from the Ian Potter NanoBioSensing Facility at RMIT University in Melbourne. The red color indicates the presence of silver nanoparticles grown by the RMIT team. Image magnified 200 times. Ramanathan said he and the team successfully tested the process on polyester and nylon fabrics too. And if you want to wash your clothes, you still can. The researchers discovered that the coating continued to eat away at stains even after 15 washes. (Some stain-resistant nanotechnology clothing have been found to stop working after just one wash). 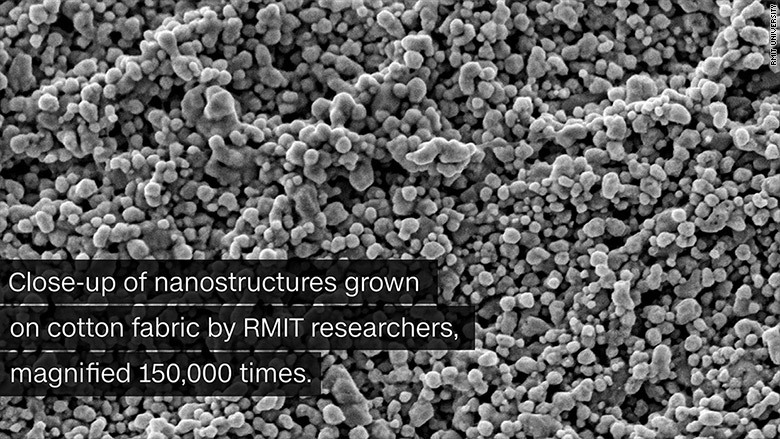 Close-up of nanostructures grown on cotton fabric by RMIT researchers, magnified 150,000 times. Silver has been a known antimicrobial element for centuries. The ancient Greeks and Romans put silver coins in their water to prevent bacteria from growing. Today, many medical garments and wound dressings are treated with silver for the same purpose. A few years ago, researchers in China found a way to make self-cleaning fabrics too. But their process used different particles and took more than 18 hours to coat the fabric and for the stains to start disappearing. In contrast, this new process can coat and clean the fabric with the micro-materials in less than 40 minutes. Ramanathan said he hopes that the experiments will convince textile manufacturers to treat their materials with this solution during the production process. Bottling it up and selling it in the form a one-step detergent could be another option. But he says he wants to make self-cleaning laundry easy for consumers to take advantage of.